A self-taught artist with experience in painting (watercolor and oils) and sculpture, Vikki enjoys a passion for color and flowing designs. She developed a simple layering technique that is a blend of piecing and appliqué. She is the author of two books featuring this technique, "Quilting Curves” (Quilt Digest Press, 2001) and “Quilting By Improvisation” (Dragon Threads, 2006). Also, Vikki has written “how-to” articles published in Quilting Arts, Quilter’s Newsletter, and AQS magazines. 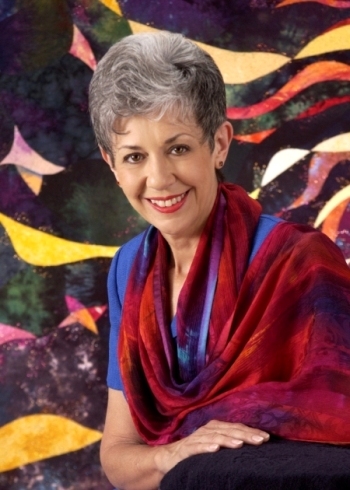 Vikki also founded the national biennial Sacred Threads Quilt Exhibitions in 1999. She and chairwoman, Wendy Bynner, developed the vision for the two-week display of original artwork that explores themes of spirituality, joy, inspiration, peace, healing and grief. The show is now held in Herndon, VA, outside Washington, D.C. Deeply influenced by her husband’s bout with cancer and his recovery in 1993, most of Vikki’s artwork now focuses on the themes of healing, spirituality, hope, and inspiration. In her writings and teaching, Vikki's focus is to inspire, nurture and develop the artistry and self-confidence within each quilter. The contents of this site are protected by copyright. Any reproduction of the quilt images or text in whole or part without the written consent of Vikki Pignatelli is not permitted. Website designed and hosted by Lisa Ellis.